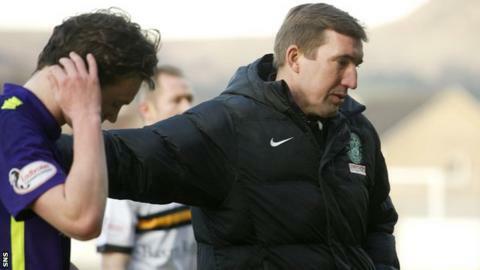 Hibernian head coach Alan Stubbs lamented how his side "gifted" Dumbarton victory as the Easter Road men's title hopes were dealt a blow. The Sons beat Hibs 3-2 on Saturday, allowing Scottish Championship leaders Rangers to open up a gap of 11 points. Liam Henderson and Farid El Alagui replied after the hosts had raced into a three-goal lead in Dumbarton. "No matter who you are, you can't give someone a 3-0 lead and expect to bring it back," Stubbs told BBC Scotland. "But I've got to say, we gave it a good go. "We've more or less gifted Dumbarton the three points with the goals we've conceded. "I can't fault the players' effort but in the last couple of games we've contributed significantly to our downfall. We're just making silly individual errors and unfortunately right now we're getting punished for them. "It's lapses in concentration. More often than not you can get away with one but in the last two games we've been punished. We need to have better discipline when we're defending set pieces and stay with our men." It was a second straight loss for Hibs with Greenock Morton having won 3-0 at Easter Road on Wednesday. "There will be no concession because mathematically we can still do it," said Stubbs, whose side have 10 league games left. "But we're obviously making it really difficult for ourselves and making it easier for Rangers. "We've lost four games all season so there's certainly no monkey on our back but we need to bounce back very quickly. "We wanted to do it today and it wasn't for the want of trying." Dumbarton manager Stevie Aitken described the final 15 minutes of the game as "probably the longest I've had in my career as a manager". Kevin Cawley, Christian Nade and Darren Barr had netted for the hosts in the opening 50 minutes before Hibs' resurgence. "I was desperate for the final whistle and we had to dig in deep," added Aitken. "To beat a good Hibs side twice now; I'm delighted we got the win and I think over the piece it was deserved. "It was tough towards the end. Credit to Hibs, a lot of teams might have flung the towel in at 3-0 but they came at us, scored a couple of good goals and put us under severe pressure."